To Catch A Spider: Frontier Airsoft, Penkridge, Staffordshire. 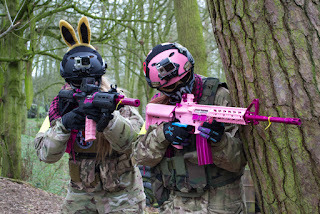 On the Easter Bank Holiday weekend I had the pleasure of being invited to Frontier Airsoft in Penkridge, Staffordshire – an hour away from my home town to play their Easter Special game ‘To Catch a Spider’ by a member of the UKAC (United Kingdom Airsoft Community). The site is around 10 minutes outside of Cannock and is easily accessible from the A513 or the M6 Toll. I took the A516 and the site was easy to get to, unfortunately Frontier isn’t signposted so I ended up at the Farm across the road! However, I have spoken to Bill, the owner and he has assured me that this is just temporary and the signs will be going back up soon! A quick google led me back up the track and onto the other side of the road, a short drive down another track and I was there! There is ample car parking that is directed by a site marshal and as the site is popular I do recommend arriving as close to 08.30 hours as possible, so you get a good space. A short walk from the car park leads to the safe zone, which is a circular clearing surrounded by sheltered booths and each booth was separated by material and they were equipped with a table and chairs, they also had their own theme. I really liked that all the booths were separated as it provided every team with their own ‘base’. Booking in was incredibly easy and done via the Frontier website and payment was taken on the day – one of the things I really liked about the site management is that the communication was fantastic and my emails were answered promptly! Nothing was too much trouble. There is tea and coffee on tap and the walk on fee of £25 was reasonable and even included lunch! As it was one of the guys birthday and we informed them, he was given a lovely personalised Frontier T-Shirt, a great touch and really made him feel welcome to the site. The safe zone is also home to the office where booking in takes place and it also has a little shop where you can buy Frontier’s own brand of BBs in various weights, pyros and patches. I purchased the 0.2g BBs, priced at 2000 for £5 which was very reasonable and they fed well. Next time I would however buy the 0.25g BBs because it was quite windy when I visited and the wind did take the rounds. Chrono was done on the purpose built range which had lots of interesting statues and targets! Including a poor fellow who had his crotch shot out (Ouch!) The staff are very strict on the guns they allow to be used on site, 350 FPS on 0.2g BBs and no more! The comprehensive safety briefs were carried out by the owner Bill and Head Marshal Jester and were simple and straight to the point – the last thing you want is overly complicated briefs that end up confusing the players! 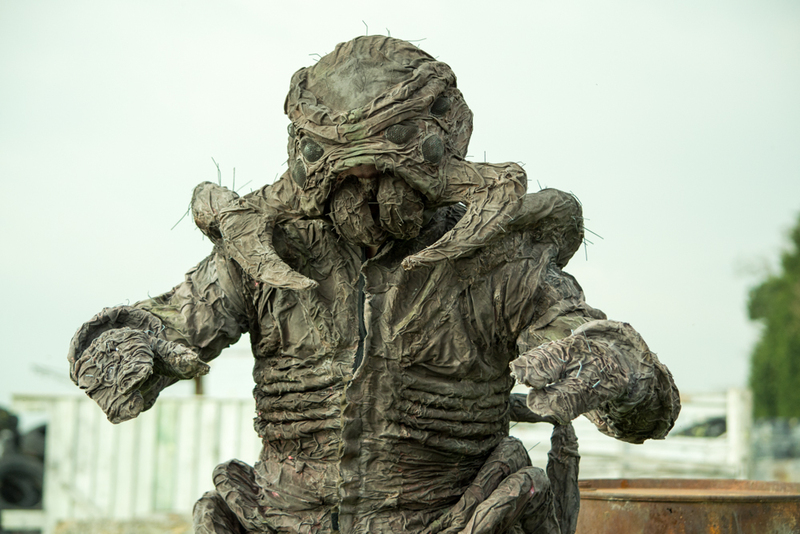 One thing that I feel really makes or breaks a site is the site staff! I cannot fault the staff at Frontier, they were professional, friendly and made everyone feel really welcome. The day was full of banter and the marshals routinely checked that everyone was having a good day. The only thing that I will say about the safe zone that concerned me was players dry firing in the booths – as a community we need to look after each other and even though you may be certain your gun is clear, it only takes one stray BB to cause some damage. However, I spoke to one of the marshals during a quick break in the games and it didn’t happen for the rest of the day. The site itself is a 25 acre woodland site that is shared between Frontier and a paintball company, it is one of the smaller woodland sites that I have visited but don’t let the size put you off, it can comfortably accommodate 60-70 players and the Frontier staff utilise every square inch of the site, and have built multiple structures and ‘zones’ which offer different types of game play. Including the Fort and Team Death Match areas which are both used for attack and defend games. They offer both long distance engagements so you can play as a Sniper and a CQB element as you fight your way into the heart of the enemies defence. The site is full of different levels – high ridges that look out over the forest floor and the bowl at the heart of the site which keeps the games interesting and the players on edge! 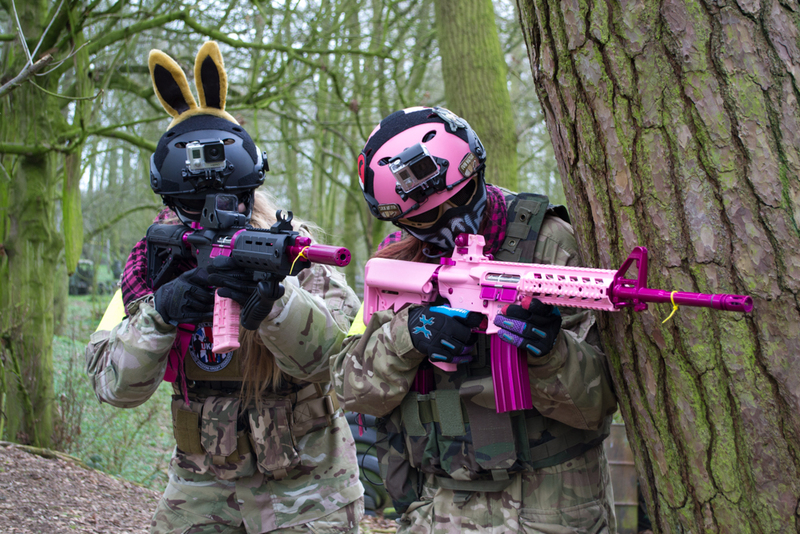 Frontier Airsoft is a site that specialises in story arch games so if you get bored of the usual team death match or capture the flag, this site is definitely for you! All the games except the warm up death match were story based objective games. For the Easter Sunday special we played the story ‘To Catch a Spider’. The theme for the day was that two rival teams of poachers had gone to Zootopia Park to capture an arachnid creature that the parks resident evil scientist had created and whilst they were there, decided to eliminate the opposing team! What I really like about theme based games is that each one is different, it’s not a generic Team Death Match and shows that a lot of thought and effort has gone into making the day the best it can be. I love the characters and the costumes of theme based games as well! 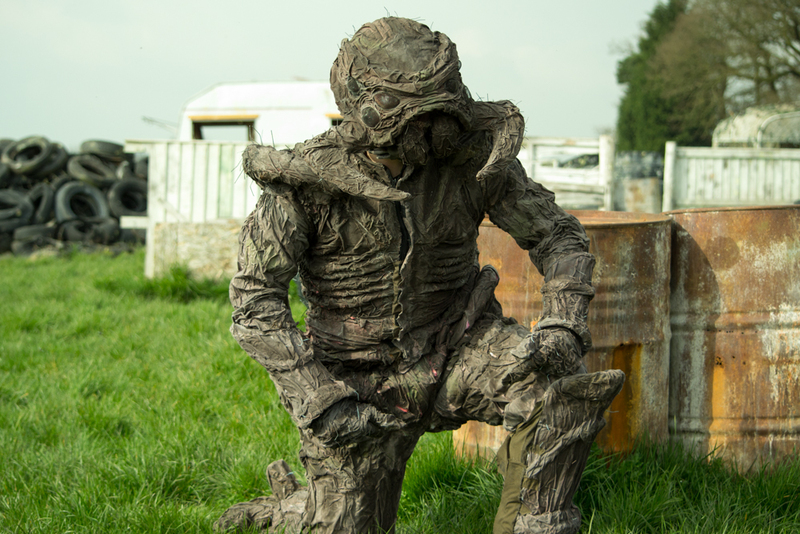 The costume Frontier Airsoft’s staff have lovingly handcrafted for their Spider based storyline is really something to admire! I didn’t quite believe the photo I saw before the game but you have to see it to believe it. Each game is played on a different part of the site to keep things fresh and I have to say my favourite games of the day were the last two of the day – a 3 stage defend/attack game in various parts of the site including the team deathmatch zone, which got my adrenaline pumping so much that my hands were shaking as I reloaded my mags in the safe zone! And the ‘To Catch a Spider’ game – for that game we had to throw down a smoke grenade ‘pheromone’ (we were allocated 2 per team!) to attract the arachnid creature and when he knelt down we were to capture him with the ‘Spider Catcher’ prop. After 10 minutes of searching the forest and engaging the enemy team, we spotted the Arachnid and one of the guys threw the smoke and started laying down suppressing fire to cover me whilst I went to capture the creature! Once the creature was on its knees, I rushed over and put the catcher on his wrist and led him up the ridge into the ‘town hall’ whilst my team mates made it rain BBs. Only one word can describe that game – EPIC! One thing about a site that really affects how you feel when you leave at the end of the day is the level of sportsmanship from the other players. Frontier caters for all ages and abilities so you will see a very diverse mix of new and seasoned players which made for interesting game play. I personally, didn’t encounter any incidences of non-hit taking but I did hear a few grumbles whilst walking back to the safe zone, but the important thing to remember about woodland is because of the distances involved and wind taking rounds, it can be difficult to gauge whether you actually hit them or not, if in doubt always speak to a marshal. Kelly - Thank you for letting me do a review on Frontier, can you tell our readers a bit more about you? What’s your Airsoft background? Bill - I started playing Airsoft about 8 or 9 years ago at a small local site near Coventry. After 2 years, I started working at another, much larger Airsoft site as a marshal for another 2 years. There I received lots of good training and insight into the business under the manager. Then in 2011, I left to start my own Airsoft company and Frontier was born. Kelly - What originally got you into Airsoft? And what do you love about it? Bill - What I love about Airsoft, first and foremost is getting to play with guns, as a kid we would stage mock battles and scenarios with toy guns in the local woods and I guess I never stopped wanting to do that. The other thing that makes it so awesome is the community and friendships, I have literally made some lifelong friends because of Airsoft. Kelly – What is your playing style? Bill - Never give up! Someone has to be the first in! But always remember never to ask someone else to do what you wouldn’t. Kelly - What is your weapon of choice? Bill - I mainly run big chrome Revolvers and 1911’s, but I’ve had many weird and wonderful guns over the years! Kelly - What loadout do you normally run? Bill - A cowboy hat, western holster and a smile are the only consistent things you’ll see me in. Kelly - Tell us more about Frontier! Bill – The site has been running since 05-06-2011, but the company was running for about 6 month prior to opening - all the marshals I would consider to be close friends and I feel that translates into how we work as a team together, I’d never be able to have made frontier what it is without them. Behind the curtains there are also the unseen elves, friends and family who tirelessly spell check the game stories I write, run and control the website, build amazing props that have to be seen to be believed, edit the hundreds of photos taken on a game day down to a select album, do the accounts and generally make the gears and workings run correctly and professionally. Without all of the above, there would be no Frontier Airsoft. We have a different story every week that’s all linked into one universe, all our games effect each other and tie in characters and plots. 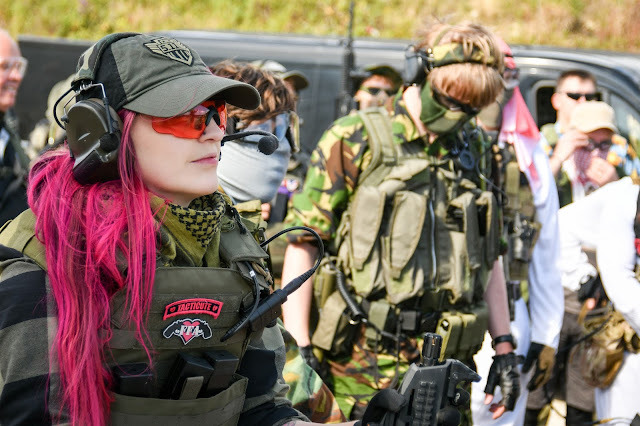 Overall, I would recommend Frontier Airsoft to new and experienced players alike as I had a fantastic day – the staff were welcoming and professional, ran a great game day and used their site well. The other players were friendly and made good opponents (ahem, targets). The walk on fee is a little cheaper than some of the other skirmish sites that I have visited and as lunch was included this was a nice surprise and excellent value for money. The story elements and costumes in their games mean that this isn’t like every other skirmish – expect something special! All the games kept us entertained and wanting more! At the end of the day each player received a ‘Frontier Airsoft Easter Special’ dog tag to remember the day - a great touch. Thank you to Gaz Ward, the onsite photographer for the photos! 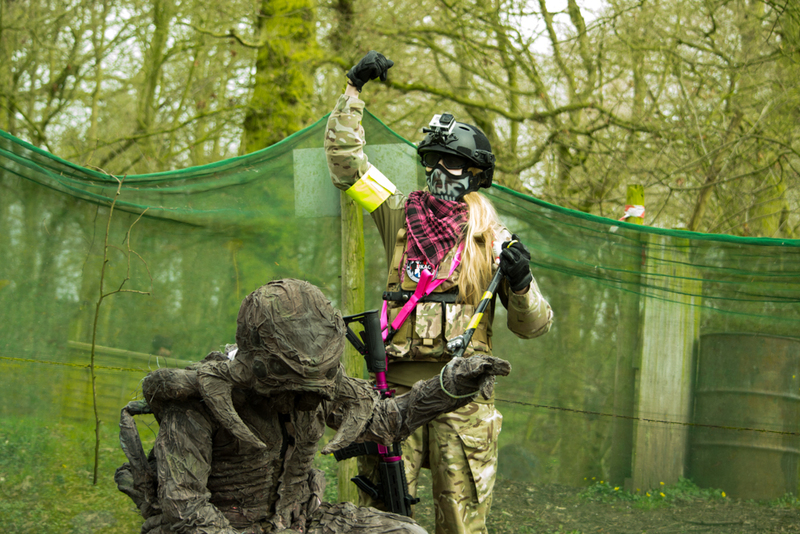 Games are run every Sunday and for more information you can find Frontier Airsoft on Facebook as ‘Frontier Airsoft’, on Instagram as @frontierairsoft and also at their website www.frontierairsoft.co.uk where they post all the details for their upcoming games, booking and game photos! The site is located at Lower Drayton Farm, Penkridge, Staffordshire, ST19 5RE and is owned by William ‘Bill’ Newman, contactable on 07590255914. K.Hardwick. (2015). To Catch A Spider. Airsoft Action. July (50), 20-22.